You got to love the sweet irony of the almost simultaneous announcements of the President’s new gun control regulations and Smith & Wesson executives raising their sales and earnings outlook for the current quarter and its fiscal year. Not surprisingly Smith & Wesson stock is setting 52 week highs. Over the last couple of years when the President speaks about gun control, the demand for guns and the stock price of Smith & Wesson has risen dramatically. Obviously the American people do not trust the President on gun control. 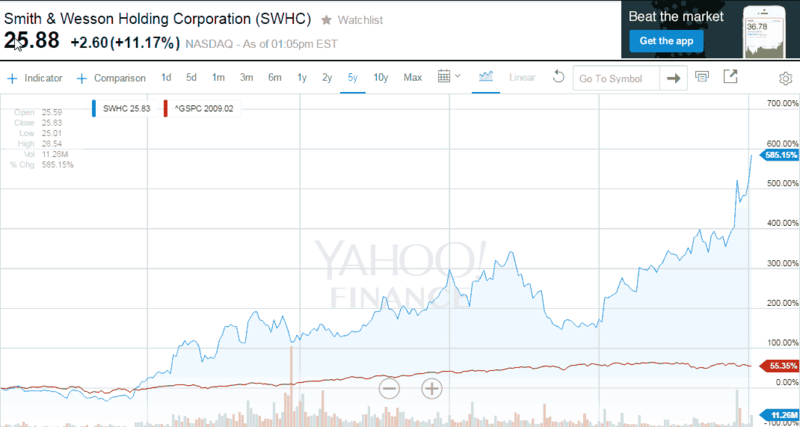 Here is the stock chart of Smith & Wesson and the S&P 500 over the last couple of years. The San Bernardino killings is a sad reminder that the Administration is a loser when it comes to protecting the American people from terrorism. If our country is not willing or able to protect its citizens, it is time to man up and carry a gun. This entry was posted in Gun Contol, Personal Finance and tagged guns. Bookmark the permalink.